This week, open technology and knowledge advocates around the world mourned the execution  of Bassel Khartabil, an open web advocate  and close friend of many in the Global Voices community. 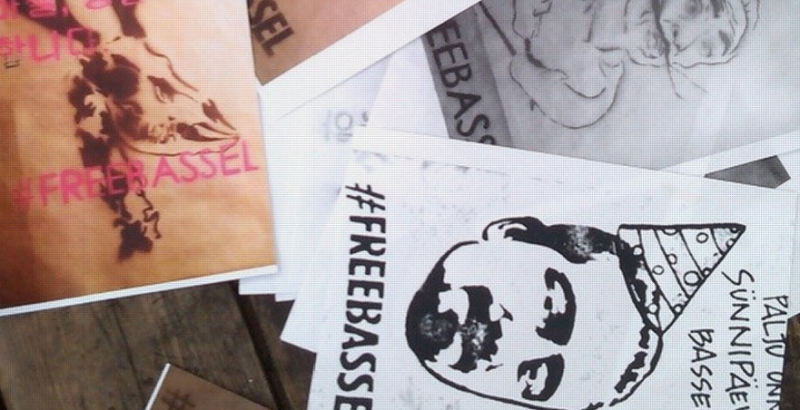 Bassel was reportedly sentenced to death in November 2015, at which point his whereabouts and condition became unknown. His wife Noura Ghazi  learned this week that he was executed in 2015. Khartabil spearheaded the open source technology movement in Syria, as an avid contributor to global projects like Creative Commons and Wikipedia, and as co-founder of the country’s first open technology lab in Damascus. To honor his country’s historic past, he worked with technologists and architects to virtually reconstruct  the ancient city of Palmyra, in hopes of reviving its historical notoriety. Like so many other peaceful technology developers and activists in Syria and beyond, Khartabil was accused of “harming state security.”  In a December 2012 military field court proceeding, he was interrogated by a judge, but to his family’s knowledge, never received further word on the status of his case. In a one-day trial on July 25, the People’s Court in Vietnam’s Hà Nam province sentenced Trần Thị Nga to nine years in prison and five years of house arrest for “conducting propaganda against the State.” The 40-year-old Nga, also known by her pen name Thúy Nga, is a prominent advocate for migrants  and land rights. She has also been documenting and campaigning against police brutality on her Facebook page and her YouTube  channel. Nga has been frequently intimidated and physically attacked by police for her work. A government employee in Brunei was charged with violating the Sedition Act  after he complained on Facebook about new Halal certification regulations released by the Ministry of Religious Affairs. Global Voices’ Mong Palatino explained that given Brunei’s stringent media regulations, issues related to civil liberties are not often discussed online. “That's why the [online] conversation about Shahiran's case provides a rare glimpse of how some netizens think about the situation in the country today,” he wrote. In an effort to more closely examine this connection, the Global Internet Forum to Counter Terrorism  convened this week in San Francisco. Formed by Facebook, Microsoft, Twitter and YouTube, the Forum includes representatives  from the tech industry, government, and NGOs to discuss and respond to critiques  from the European Commission and other governments that tech companies need to do more to combat terrorism and hate speech on their platforms. New research  by Global Voices shows that Free Basics, the “free” mobile version of Facebook, makes it difficult for users to assess the reliability of news articles. The app only allows users to read headlines and the captions of photos, stripping away valuable context that helps users determine the validity of the information in a news report. Given the proliferation of copycat websites spreading fake news, this makes it easier for Free Basics users to spread false information without realizing it. Tajikistan’s parliament passed a set of amendments  to the country’s criminal law that grant security services the right to monitor and control citizens’ online activities. This includes keeping detailed records of SMS and mobile messages, social media comments, and anyone who visits websites deemed “undesirable”, though it is unclear what sites would qualify. The law also criminalizes making comments that could damage someone’s personal honor or undermine national security, with a minimum punishment of two years in jail. The legislation marks a shift in approach for the Tajik government, away from using censorship to ban controversial websites and services, instead opting to monitor citizens’ activities across the web. On June 24, Palestine passed a new law  regulating online transactions, media websites and social networking sites. The law outlines a number of “cybercrimes”  that can be punished by up to 15 years in prison or hard labor for life. While it lists a few cybercrimes that should be fought at all costs such as sextortion, fiscal fraud, and identity theft, it also gives the public prosecutor's office unlimited powers to surveil Palestinian citizens, intercept their online communications, and arrest them for airing their opinions and political views online. The law was approved  by President Mahmoud Abbas just two weeks later, with no opportunity for input from civil society. Apple informed customers it will take down VPN services  from its app store in China to bring it into compliance with the government’s crackdown on companies offering VPN services to the general public. However, Chinese users can still download and continue using such apps as ExpressVPN  if their Apple accounts are registered in overseas app stores with a billing address outside of China. Ellery Roberts Biddle , Mohamed ElGohary , Leila Nachawati , Inji Pennu  and Sarah Myers West  contributed to this report.